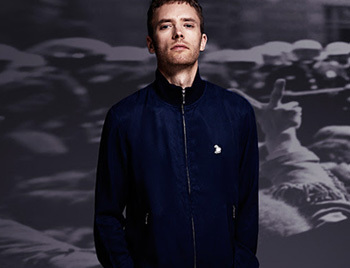 The term Bomber Jacket has come to mean any short Blouson (pronounced bloo-zon) style jacket. It originally described a style of Military Aviation jacket specifically created for just that, bombing raids. The original woollen A1 and later the leather A2 flying jackets sported a collar which could be studded to the body to prevent them flapping in the wind, they featured flap/patch pockets and most importantly for the aviators, knitted cuffs and waistband, to create grip at waist and wrists keeping cold air out and warm air in. The A2 quickly became seen as a genuine staple style and was worn by many famous actors on set for their roles in war films (Frank Sinatra - Von Ryan's Express, Gregory Peck -Twelve o'clock High, Steve McQueen - The Great Escape) it was also very fashionable for them to be seen off set too and soon became a must have item. This season choose our luxury Fur Lined Bomber jacket in soft leather, a key Black Label piece and a favourite of our Design Directors. For something more casual our Vickers Bomber is the ultimate throw on jacket crafted from a lightweight two tone nylon twill with a metallic iridescent appearance. Our Woodstock Bomber is a collectors piece, featuring the White Dove motif and soft breathable fabric for a relaxed feel.